Her fingers were always too shaky to type. Even a decade ago, when she was fresher, healthier, bouncier than she is now, she couldn’t do it. But she so wanted to. One day she came home and told me that her friend Bobbi had WebTV, that petrified totem to dialup, and that she wanted to email her. We walked over to the computer. Her fingers jangled above the keyboard. “Hhhhii Boobbbii,,,” the email started. She got frustrated and walked away. Over the next 10 or so years, she never quite returned. She’s 84, my grandmother, and as Dutch as a former American can be. Born in Holland, hidden in Holland, repatriated to Holland, she comes to visit about two times a year now. But otherwise she lives there, where she once saw a Nazi playing with her toys in her backyard. Where she was shuttled from hideout to hideout as a kid. Where her family went missing and all but her sister never came back. But, as is always the case, now is not then. Now she lives in an Amsterdam apartment complex designated and subsidized for the elderly. It’s the kind of socialized benefit that makes too much sense to be offered in America. She moved to it when she was 77, spooked by a dysfunctional American healthcare system and nostalgic for her small remaining family overseas. Her children are here, her grandkids are here, and the country she once called home is here, but her 89-year-old sister is there. And so she is there. This Thanksgiving, she was here. She flew to Maryland and then to Florida, where all of her kids and grandkids paid a visit, if not tribute. In the house it was loud with the sound of crosstalk, the kind of ambient chatter that shows like Parenthood try hard to manufacture. She didn’t follow it all; her ears have never been the same after the war — or perhaps, given how long it’s been, it’s more accurate to say her ears have always been the same since the war. “I don’t understand you!” she said every now and then, a resigned smile on her face. But it wasn’t the volume — we all long ago learned to talk to her with a raised voice — it was the speed. The conversation was moving too fast to track. Age had finally eclipsed her hearing aid. Her grandkids — even the 14-year-old, especially the 14-year-old — all had smartphones. We lurked with them in corners, half-present, half-removed, half-aware of how rude it probably was. She watched us with a kind of charmed love, the glance that comes from some evolutionary reservoir, the one that only grandparents can go skinny-dipping in. Her eyes shook a little bit and her mouth rediscovered the wrinkles that framed it long ago. “Who are you talking to?” she asked in her clipped, guttural accent. No matter what the answer was, it wasn’t her. She had her own life, too, of course. There was Bobbi, and Shirley, and whoever else ambled in to a restaurant for tea in the middle of the day. She was a woman about town, visiting the knitting shop, the Trellis Diner, the synagogue. So she was active — not a skydiving granny or anything, but still active. She was a woman who every now and then wanted to live outside of herself. But she never did that living online. She was surrounded by technology in our house — she’d watch me play video games for hours — but she never partook herself. She looked over our shoulders as we used a laptop, she used our cellphones without actually dialing the number herself, and she pronounced Internet with hard t’s as though it were something as foreign as her accent. It was a world that she only glimpsed through a telescope, curious to look but never expecting to get there herself. On the day most of her family left, she picked up an iPad. “Do you think I’d like this?” she asked. And I said yes, yes she might. She held it above her lap. It quivered in her knotty, wrinkled hands. Is there anything more alien to a young person than an old person’s hand? Its veins and joints are all visible. Its thin skin droops, scuffed by burns, pets, diapers, steering wheels, doorknobs, and whatever else has brushed by in 80-plus years. Its muscles have withered, wizened down to their most essential bits. Bracelets — the same bracelets that have been on since as far back as you can remember, and even further — sag off its thin wrist. It’s still a hand, but it’s also clearly something else. An artifact, maybe. She used those hands to put the iPad down on her knees and used one of those craggy fingers — nails impeccably painted orangeish-red — to make the thing work. She ran it along the bottom of the screen and began anew. Manufactured hysteria over death panels and the like means that this country talks a lot about how strange it is for kids to start taking care of their parents when they get old enough. How the cared-for must now become the caretakers. But watching a grandparent grow old — rather, grow older — is a little different. My grandmother never tossed a Frisbee with me, never advised me about my first girlfriend, never went out to a bar with me after I turned 21. (Though there was that one episode with the Brandy Alexanders at Cousin Scott’s wedding. “Uch! I never!” she now denies.) None of that was part of our relationship before, so none of that could be mourned for now. Our dynamic — being content in each other’s company — wasn’t changing, so it wasn’t in danger of being lost. But she was losing her own. This grandmother who was afraid of what might happen if she tried something new, this was a different grandmother than I grew up with. I think I’ve spent more hours with her than with anyone else in my life, and this is not the memory of her that I tote around with me. So it’s not that she’s getting old — to me, she was always old. It’s that her scope of possibility isn’t as large as it once was. Her aperture has narrowed. Her fingers were not too shaky to type on the iPad. Without the spring-loaded keys of a regular keyboard she could press down fully on the iPad’s glass screen until she was ready for the next letter. Within minutes she wanted one of her own. And so we got her one of her own. The fear of forgetting how to use this new thing was overwhelming. It had taken a decade to get there, but now that she had this technology, she never wanted to lose it. After she made her first videochat call, she closed her eyes and brought her hands to her face. She was overwhelmed with what was finally within reach. “Already I don’t know how to live without it,” she said on her third day with it. I started to look into those Korean Internet rehab centers you always hear about. 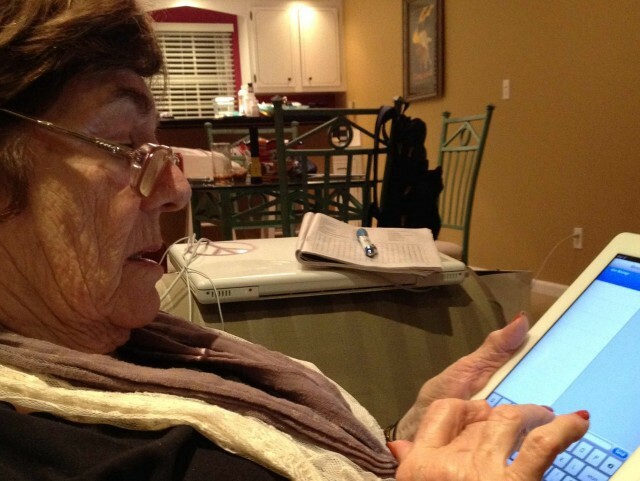 She started taking the iPad to bed with her to play Solitaire. It was the same bed she had spent the week in and out of; nursing that cold so another one couldn’t metastasize on top of it. But now the context was different. Now the cold was being crowded out by something new: the glow of a screen. Eventually she thought to finish what she had started. She asked if she could email Bobbi. Somehow she still remembered the email address. Now she finally had the means. But then when she sat down with the iPad to do it, she hesitated. “I don’t know what to write right now,” she said. And so instead we lingered on the couch for a little while longer. Grandmother and grandson, together with our technology. Chadwick Matlin is a senior editor at Reuters. He calls his grandmother Nana.